Dressellians were a tall, thin, humanoid species with elongated, hairless skulls, wrinkled skin, and teal-colored blood who valued freedom above anything else. For most of their history, they lived a peaceful and isolated lifestyle on their homeworld, Dressel, until the Galactic Civil War forced them into closer contact with the rest of the Galaxy as supporters of the Alliance to Restore the Republic, and later, the New Republic. Dressellians evolved in the sub-equatorial grasslands of Dressel's main continent, Breehara. Two centuries before the Galactic Civil War, the Dressel system was discovered by Bothan scouts. At the time, the Bothan Clan Askar decided to leave the low-tech natives of the planet Dressel alone, restricting their activities to mining the Dressellian asteroid belt. The Dressellians did have limited contact with the Galactic Republic, however. One such Dressellian was Jedi Knight Reeft, who served the Republic in its waning years. This changed when the Galactic Empire took control of the system around 10 years before the Battle of Yavin. The Empire moved to set up bases on Dressel and exploit its natural resources. The Dressellians, despite having only loose political organization and barely industrial-level technology, began a resistance movement. At first, their resistance groups had limited effect on the Imperials. As time wore on, however, the Dressellians became masters of guerilla warfare, making the continued occupation of Dressel very costly for the Empire. Dressellian guerillas armed themselves with a mixture of their own equipment and captured Imperial weapons and repulsorlift vehicles. Once the Bothans began to throw their support behind the Rebellion, they began to smuggle equipment, weapons, and mercenaries to train the Dressellians. 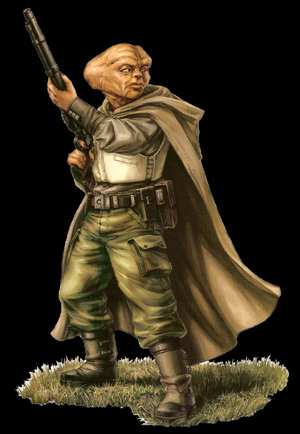 The most prominent Dressellian during the Galactic Civil War was the Rebel commando Orrimaarko, nicknamed "Prune Face." Orrimaarko was present in the briefing room aboard the Mon Calamari Star Cruiser Home One before the Battle of Endor, and later participated in the battle as part of General Han Solo's strike team. After their homeworld was liberated, Dressellian society returned to its former state, with the former underground leaders becoming the leaders of Dressel's array of loosely organized participatory democracies. Once free, the Dressellians preferred to keep to themselves. They became members of the New Republic, but their Senatorial delegation frequently skipped votes unless coaxed into participating by their old Bothan allies. This changed during the Yuuzhan Vong War, when many Dresselians once again took up arms to defend their homeworld and the rest of the galaxy.